Samsung has announced that it is mass producing a new processor that could make future smartphones capable of gigabit LTE, 4K video recording and ultra-high def virtual reality. The Exynos 9 Series 8895 claims to be the first processor chip to utilize 10nm FinFET process technology, which Samsung boasts offers a 27% performance boost over its 14nm counterparts while consuming 40% less power. As for what that extra 'pow' can really do, the tech giant claims the eight-core processor's powerful GPU handles 4K UHD video recording and playback at 120fps - extending that fidelity to low-latency virtual reality experiences at 4K resolution. Should this actually work in practice, Samsung's next generation of mobile devices could be on the bleeding edge of VR, offering a framerate and resolution current headsets, like Google's Daydream View and Samsung's own Gear VR, can only dream of. Bound for the Samsung Galaxy S8? The chip also hosts a gigabit LTE modem, capable of downloading data wirelessly at over 1Gbps and upload times at up to 150 Mbps, possibly opening up the door to future 5G-ready phones from Samsung in the future. 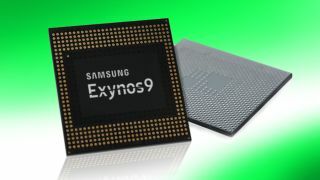 More interestingly, however, is that Samsung is already mass producing the Exynos 9 8895 ahead of the still-unannounced Samsung Galaxy S8, leading us to wonder if the processor will debut inside the new flagship phone when it launches this spring. Reports suggest that at least in the US and China, the Galaxy S8 will run on an octa-core Snapdragon 835 processor supplied by Qualcomm. Meanwhile, other rumors point to the Exynos 9 8895 making an appearance in Galaxy S8s sold everywhere else. So, while it's not yet confirmed, we may see Samsung's latest chipset in action sooner rather than later. Either way, Samsung's next handset has ample potential to be a serious heavyweight contender, if not outright champion. In the meantime, we'll just have to sit tight before we learn for sure what Samsung has in store. MWC 2017 is almost here!